Indiana Hospitals providing big community benefits! 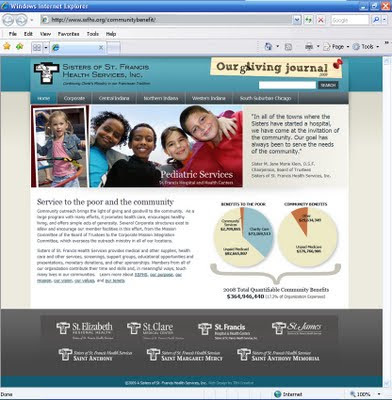 TBH Creative was hired to design and build a web site to present the community benefits of the Sisters of St. Francis Health Services in 2008 - comprising of seven hospitals here in Indiana. Together as an organization, they offered $364,946,440 in benefits to surrounding communities! These not-for-profit health care providers offer such outreach with simple acts of generosity hoping to bring the light of giving and goodwill to the community. Services offered on this project included: reviewing and organizing the large amount of information pertaining to the community benefits offered, designing a unique and easy to navigate structure to house the information, and working to format each page and massage information as needed to best represent the hospitals' services. For functionality, we developed the site base HTML and CSS to work around their IT staff's content management system. Check out the new web site summarizing the benefits, programs and good will. About Sisters of St. Francis Health Services (SSFHS) SSFHS looks for opportunities to serve communities through the very best in medical care and service to the less fortunate among us. They put their mission of “Continuing Christ’s Ministry in our Franciscan Tradition” into action and practice in our daily lives. The SSFHS hospitals include: St. Elizabeth, St. Clare, Saint Anthony, Saint Anthony Memorial, Saint Margaret Mercy, St. Francis (in Indianapolis & Beech Grove), and St. James. "In all of the towns where the Sisters have started a hospital, we have come at the invitation of the community. Our goal has always been to serve the needs of the community." Sister M. Jane Marie Klein, Sisters of St. Francis Health Services, Inc.
TBH Creative is your one-stop shop for web site usability, design and application needs. We work hard to make your project its best and offer a successful solution. Contact us today for high quality Indianapolis web site design.